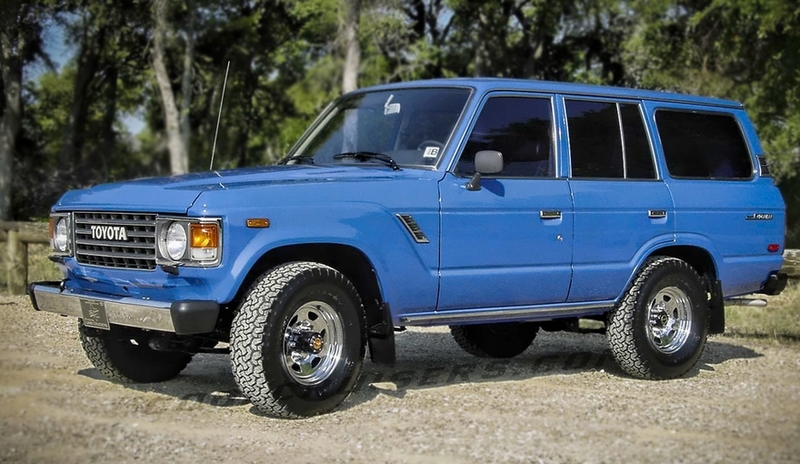 The FJ-60 Toyota Land Cruiser 4X4 Wagon is equipped with a 4-speed manual transmission (only), and a 4.2 litre straight 6 cylinder motor gasoline engine. Standard Equipment: power steering and brakes, air conditioning, rear heater, reclining bucket seats, locking hubs, all cloth interior (gray or tan). The FJ-62 Toyota Land Cruiser 4X4 Wagon is equipped with automatic transmission, and a 3.9 litre fuel injected straight 6 cylinder motor. This updated version of the 60 series was produced from 1988 to 1990. It can be distinguished from the 60 Series by the 2 pairs of rectangular headlights. Standard Equipment: power steering and brakes, air conditioning, rear heater, locking hubs, rear window wiper/washer/defroster, all cloth interior (gray or tan), reclining bucket seats. Options: power windows/door locks/mirrors, two-tone paint. Our FJ-60 and FJ-62 wagon detail is a renewal process consisting of three phases: Interior, Mechanical and Body. 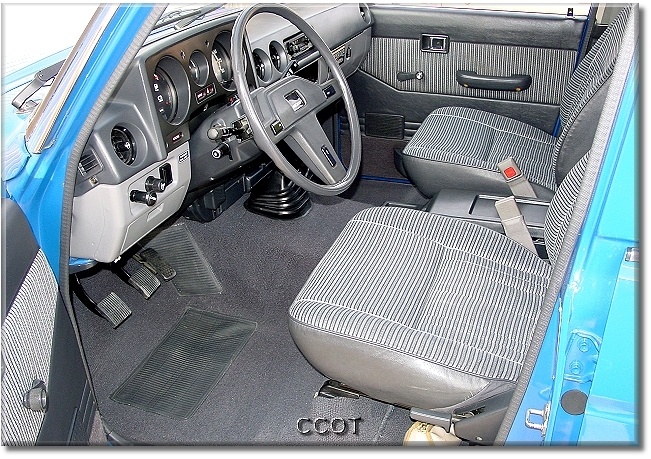 Interior Repairs: New seat covers are used to replace worn or damaged upholstery. 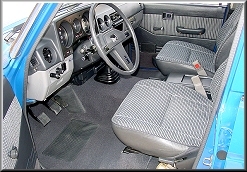 New carpet is sometimes installed as well as new headliners and even gear shift knobs and foot pedal pads to restore the original new look. The entire interior is gutted repaired / replaced and re-installed... As needed, new 31" X 10.5" tires are added with new wheel center caps and lug nuts for a strong presence. 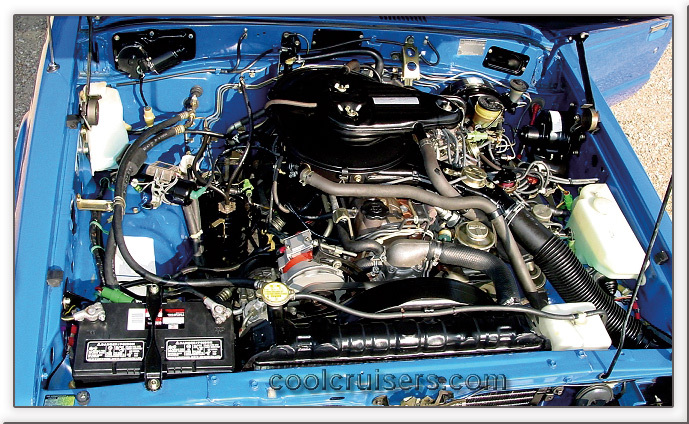 Meticulous cleaning under hood and body make our Land Cruisers show great from every angle. Factory undercoating is applied to protect wheel well and underbody frame is painted. 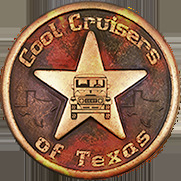 We buy only the best Land Cruisers available and make our specialized improvements, thus creating the highest Land Cruiser value for your dollar in today's market. All the above repairs are made to Vehicles, and equipment is installed, on an "as needed" basis - at the sole discretion of CCOT. Not all vehicles receive the same level of restoration. We do not make unnecessary revisions, for they will only unnecessarily add to purchase price. Please inquire about specific repairs, restoration and equipment made to Vehicle(s) being offered by CCOT. Get the most for your money... Our Land Cruisers are the market's best value. Improvements made to our Land Cruisers are passed on to the consumer at pennies on the dollar. Extremely clean Land Cruisers retain their market value like no other sport utility vehicle. A well-shopped individual is our best customer. Currently, CCOT only restores Land Cruisers that we purchase to resell. We are too backed up to restore Land Cruisers for Customers at this time. All descriptive information contained in this web site is a general overview of work done to vehicles; however, all individual "Purchase Order for a Land Cruiser" Agreements, and/or "Addendum's", and/or Individual "Contracts", made with a particular individual on a specific vehicle supersedes any and all written information contained in this web site. For example, a certain vehicle may be purchased by CCOT for resale purposes only (no work at all to be done to vehicle), or an individual may wish to pay more or less for a particular vehicle depending on more or less work being done by CCOT.